On the tip of an island near Amsterdam lies a mysterious black box. This is the house that Studioninedots built for a young family – a house full of surprises and contrasts. 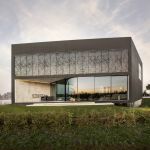 A house with dynamic spatial and material qualities: from an unlimited space with panoramic views of nature to private rooms hidden behind a veil of shutters, from sleek custom furniture against a raw concrete structure to warm timber paired with cold steel. 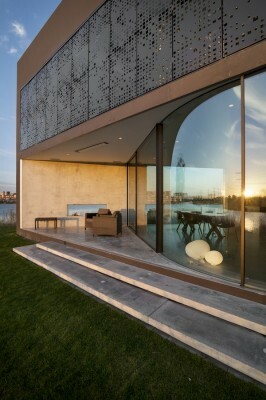 Light and views were key elements of this design. The house was completed in January 2014. Situated directly on the waterfront with unobstructed views of the opposite park, Kavel 01 (meaning Lot 01) is what you could call a dream site. But one that posed a tough challenge: how do we build a spacious, liveable home on a sharp diamond-shaped plot on this most beautiful part on the island? It seemed impractical to combine a simple rectangular volume with an angular plot with sharp angles of 51 degrees – and also did little justice to its unique form – so we based the design of the house on the shape of a diamond. On the north side, the volume is pushed towards the tip of the island thereby extending the south-west elevation; this maximises sun into the house and views over the park emphasising the relationship between inside and outside. As the glazing on the facade moves inwards from the western corner, this accentuates the feeling of openness on the ground floor. At the same time, this creates a covered terrace, which is protected from the wind. Lastly, the layout of the garden was optimised to accommodate different private terraces and a separate car park. Due to height restrictions, the house is partly built underground. This ‘secret’ domain contains the guest room, bathroom, storage, study, and children’s games room and cinema. Along the south facade, the ground is carved out to permit sunlight into the basement; from below, this opens up views over the garden. This intervention transforms the appearance of the volume dramatically: from here the house seems to float above the ground. A set of stairs provides separate access to this part of the house from the outside. In contrast with the openness of the living room on the ground floor, the first floor feels intentionally more closed and private. 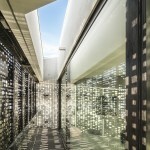 The three bedrooms are wrapped behind black veils made from 33 shutters of perforated steel. 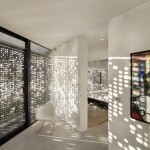 Thanks to the code-like composition of square perforations, lively shadow patterns are cast by the sun on the floors and walls while the shutters unfold like harmonicas with the push of a button – then voilà, the balconies magically appear. With the sliding glass facade doors open, it’s easy to imagine yourself in the middle of nature while lying in bed or in the bath. 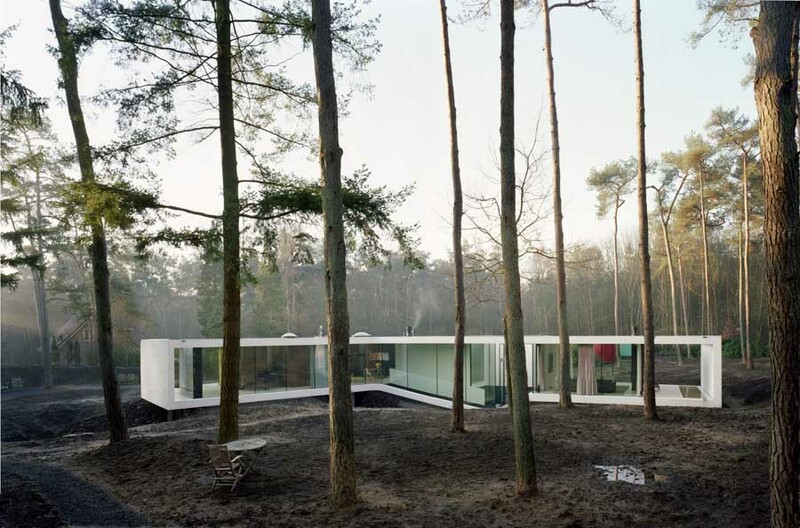 Although Kavel 01 is very defined in shape the building itself offers a wealth of spatial qualities. With its sharp angles and high elevations, the building’s appearance changes as you walk around it, from slim and slender to wide and robust. Inside, the atmosphere varies between light and airy to dark and intimate as in a nightclub. It was possible to create a largely open plan interior thanks to the load-bearing concrete facades and the structural central stair shaft. On the ground floor, all the cabinets, the fireplace, audio system, and television are concealed inside a series of freestanding custom-made furniture units, strategically positioned to create a set of flowing spaces. As minimal volumes finished in dark timber, they form a striking contrast with the raw concrete. Designing a private residence provides an excellent opportunity to experiment with new materials and forms. 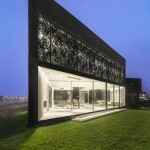 The sprayed-concrete facade and steel shutters were specially developed for this project as well as the illuminated black intercom column beside the entrance that resembles a miniature version of the house. 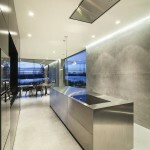 Details have been meticulously resolved from the stainless steel door handle and 4mm-thick stainless steel kitchen bench to the sink elements and shower drain. This has not only given us immense design pleasure but has also resulted in a sleek and unified aesthetic that evokes a sense of calm and serenity.